Evaphone is a VoIP server that offers PC to phone international calling for free. This free offer is limited calling time that depends on where you call, and you need use browser with flash player 9.0 or high. 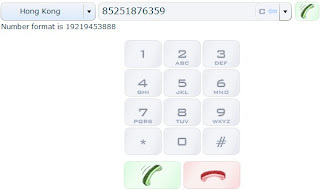 It is very easy to make calling, go to its main page, dial number that you wanted call. Before connect calling through you need watch an ads. The best thing is you do not need setup any software, even you do not need register if you want try free calling. Of course, it also offers paid calling with reasonable fee. Paid user need register.